The Wooden Camera Fixed Cage is a form-fitting cage for the ARRI Alexa Mini. It attaches to the camera with the help of four M4 screws on top and four M4 screws on the bottom, making it extremely secure. The M4 hole pattern found on the camera body is present on the cage top plate. This allows for attachment of ARRI brand handles and accessories. Arrays of 1/4-20 holes in standard spacing and multiple 3/8"-16 holes are available for large accessories. In addition, 3/8"-16 holes with adjacent locating pins are available for ARRI accessories in several places. The cage side pieces feature NATO standard accessory rails with spring-loaded safety pins on each end to prevent accidental removal. The NATO rails also feature 1/4"-20 and 3/8"-16 holes. Clamped to the side rails are two NATO rosettes (ARRI) that adapt an ARRI standard rosette to quick-release NATO rail. 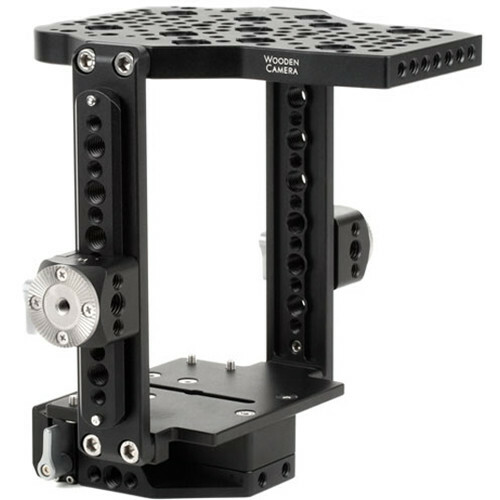 The Fixed Cage can attach directly to a tripod plate by the 1/4"-20 and 3/8"-16 threaded holes on the bottom of the baseplate. 15mm LW holes are present on the baseplate and allow for pass through rods.